Board index ‹ SEPTEMBER CLUES AND 9/11 ‹ THE 9/11 HOAX infrastructure - and its operatives: too many people involved? The most common objection people have to our research: "Too many people would have been involved to pull off such a massive hoax." Well, with trillions of taxpayers' dollars at hand, this operation could certainly afford contracting many individuals (under a gag order and on a need-to-know basis). Meet the real - and unreal - persons, companies & entities assigned to carry out this gigantic, media & military-assisted psyop. I came across this recently uploaded and longer clip of the infamous 'Harley Guy' as interviewed by Rick Leventhal which provides a little more context and names Harley Guy as a Mark Walsh http://www.youtube.com/watch?v=9q6dUd8T4o4 it is still highly fishy but was rather intrigued with 3:18 -3:35 with what I presume is a spook trying to shepherd Rick into a more dramatic position/shot - Leventhal then mistakenly and in seeming confusion attempts to conduct an interview with the aforementioned agent and is given short shrift! It's interesting how that extended 'Harley Guy' clip has only just recently surfaced. 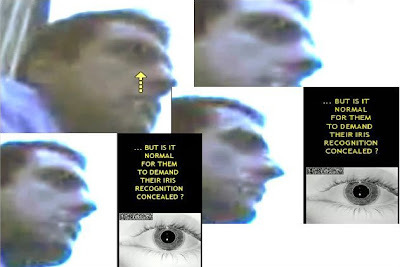 I'm working on a theory that maybe the footage of the eye witnesses, are characters put together by a computor and not actors. Because how else could the 'Harley Guy' clip have been extended, without noticing the actor being 9 years older. Although it is obviously also possible for the 'Harley Guy' from the original footage to be cut into other scenes. BTW the footage posted does not go beyond the 3 minutes. The concept of computer/virtual reality witnesses, scenes and footage is compelling - this longer clip and its recent surfacing could vindicate that notion although it could be 'footage' that was not used live and discarded. The whole segment of footage could be fake or an amalgam of fake and real people, scenery, sound, events, action etc - it really is highly and purposely confusing! The problem is, Harley Guy starts talking ("Well we had"...) while the mike is still under Rick's nose. As an audio technician, I say it is impossible for his voice to be as loud as when the mike eventually reaches his mouth - no volume change whatsoever. (Note that there appears to be no audio-vs-video misalignment on this clip - the lipsynch seems fairly well synchronized). As for the (dreadful) imagery of the surrounding ambient ("intersection of Church St & Reade St"), I am currently working to demonstrate that it's nothing but a digitally rendered street scenery - and that diverse imaging softwares were used to produce the 9/11 video material. Stay tuned. Say, I do believe that Fox Fake Witness "Mark Walsh" is Canadian actor Mark Adrian Humphrey! Rick Leventhal was allegedly standing in the Reade Street / Church Street intersection. 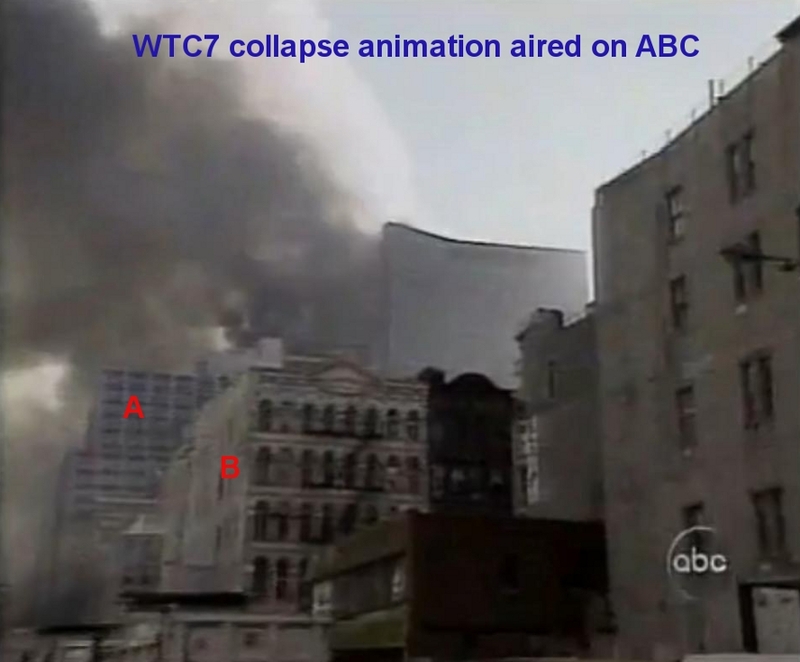 The appaling quality of many 9/11 videos do raise questions as to the reality of their 3D environment. This infamous clip (as many others) features grey patches resembling flawed digital renderings. Whether Rick interviewed "Mark Humphrey" or anyone else is a secondary issue. simonshack wrote: Rick Leventhal was allegedly standing in the Reade Street / Church Street intersection. Simon - you could have added the missing top row of windows on building B, but I guess you didn't feel the need to indicate every flaw on the footage! That's a particularly obvious error - how did they miss a set of windows?! I have a more sweeping question. How could they be so utterly inept at faking the NY scenery? Please note there's now a new building between B and C - most likely built after 2001 - but that is not the point here. What matters here is building "A": it bears no resemblance to the real thing whatsoever. simonshack wrote: be so utterly inept at faking the NY scenery? They're using an old video game trick called 'grayboxing' in which complicated objects like buildings are replaced with gray boxes to save on rendering time, and then a texture map of the building is later applied to the gray box. It's easier just to paste the image of the building onto one side of the box than to worry about getting the sides of the building right too. Think of the old Hollywood sets with cardboard cutouts of Main Street. This is the digital equivalent. They need enough of Building B to make it look a little bit like the intersection it's pretended to be. They don't obsess over the details of making it perfect. I got endless amounts of shill attacks over pointing out the flaws in their abysmal "Battery Park" simulation for CNN's notorious Michael Hezarkhani Ghost Plane fraud. The Original Hezarhkhani video even got extended in 2007 to include a peek-a-boo view of the missing buildings, notably 19 Rector Street. 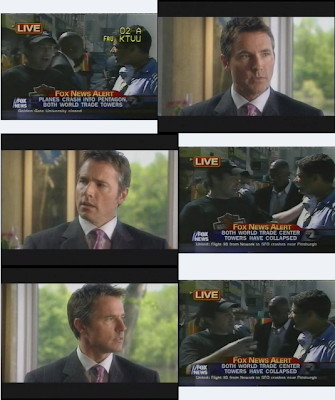 If you watch the earlier versions of the "original" fake video, no such frames existed. If anyone ever actually bothers to go to Battery Park in NYC, you will find that the details of the park itself are all missing from the CNN Fake. None of the lampposts, trees, dock, people, etc are where they should be. The audio track is extremely ridiculous. The fake video is a very poor substitute for reality, but good enough for TV audiences. The practice of filming movies in different locations from what is represented on screen is an old established Hollywood practice. To save money "New York" is frequently Vancouver, Prague, or some Hollywood studio back lot. I posit that our buddy Rick Leventhal interviewed actor Mark Humphrey in the studio before 9/11 in front of the green screen. Rick may be stupid but he's not going to stand around on the street corner while buildings are getting blown up and people are being evacuated. The primary issue here is that Rick Leventhal is interviewing an actor Harley Guy Mark Humphrey in a studio, and the secondary issue is that they're using standard studio techniques. It's not really a discovery that fictional movies use special effects and shoot off-location. I view both of the issues you advocate as extremely important. How are we going to wake people up about the contrived video and how are we going to make it known that actors like Mark Humphrey played fictional people for these propaganda pieces? These are incredible revelations that we have been talking about for a long time and people still think they're getting groped at airports because of evil brown men who want to kill us all. Whereas - it seems - the terrorists are a fictional play meant to keep the "crazed masses" docile. I would also like to humbly suggest that the names Steve Buscemi, Billy Crystal, the DeVito family and Robert De Niro are apparently not big enough to get people all excited about actors involved in propaganda. What can we do? How can we get the word out when everyone is just going to be watching the Academy Awards pretty soon, smiling and clapping for who knows what other producers and perps involved in the 9/11 drama? What will they come up with next for a shield of sympathy - will Mark Humphrey get fake-attacked by a tourist like Massimiliano Tatataterrist who throws a small replica of the Chinese Theater at his face? There are definitely good people in Hollywood, trying to get the word out about matters but it seems the bad ones are pretending to care about stuff they don't in order to "own" the stories - e.g. ; Robert De Niro plays in Wag the Dog and Simone about fictional and computer-generated sims, in order to make the public think he is informing people about the technology, when actually he is defending fake deaths in a propaganda series like 9/11! Sean Penn or someone else viewed as liberal anti-war should do a remake/sequel of Wag the Dog and do it even better in order to take it from De Niro and undermine that racist war-mongering sell-out De Niro's shield of fake good intentions. fred wrote: The primary issue here is that Rick Leventhal is interviewing an actor Harley Guy Mark Humphrey in a studio, and the secondary issue is that they're using standard studio techniques. It's not really a discovery that fictional movies use special effects and shoot off-location. I'll happily retract the primary/secondary paradigm stated above - right here and now. Primary, secondary? Who cares. How about settling for a 50%/50% draw? 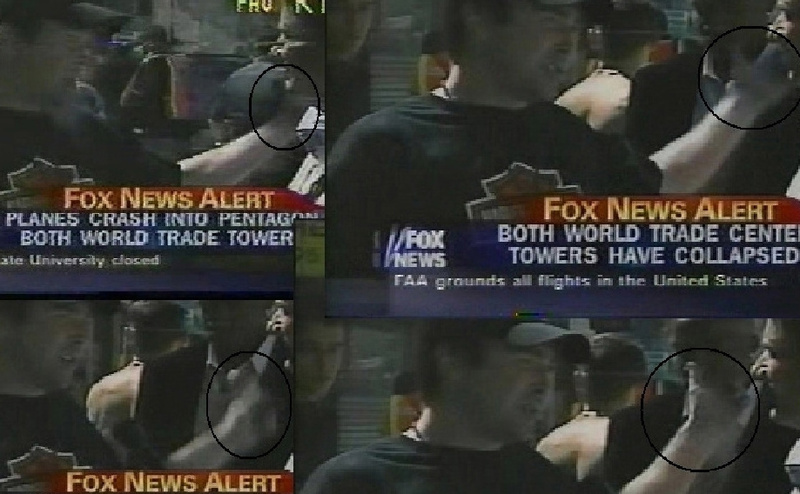 We have now exposed and called out the fraud of the 9/11 video TV imagery in every imaginable way. Gawd forbid that we now start bickering between our intelligent selves about just what levels of fraud is less/or more significant. (Fraud1) Actors filmed in a studio versus (Fraud2) a green-screen NY scenery? Well, both are frauds, no? The two concur to make up one gigantic hoax - and in a court of law the criminal guilt of its team of authors (be they actors/or video animators) would surely be split 50%/50% . 1: The soundtracks are blatantly recorded separately from the imagery; anyone could be behind the voices we hear, ergo : any voice-recognition analyses are consequently null/void/moot. 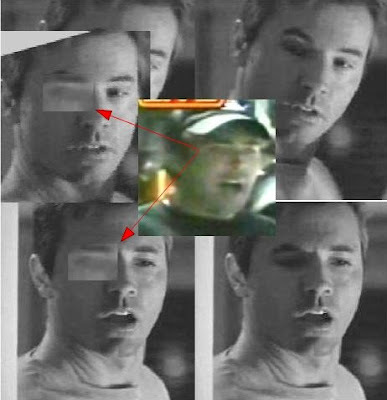 2: The ridiculously low quality of clips such as the "Harley-Guy" do not allow for any sort of definitive face-recognition, something that the perps most probably had in mind when downgrading their counterfeit video material. Additionally, the leading finger pointing to Canadian actor Mark Humphrey was that of a Canadian "Ozzybinoswald" character now gone raving mad and acting like a classic turncoat 'truther' who presently runs a smear campaign calling me a "high-level infiltrator shill" and "The Enemy". This doesn't help me espouse the idea that "Harley Guy" is Canadian actor Mark Humphrey - although I will not discard the possibility that this may be the case. simonshack wrote: Additionally, the leading finger pointing to Canadian actor Mark Humphrey was that of a Canadian "Ozzybinoswald" character now gone raving mad and acting like a classic turncoat 'truther' who presently runs a smear campaign calling me a "high-level infiltrator shill" and "The Enemy". This doesn't help me espouse the idea that "Harley Guy" is Canadian actor Mark Humphrey - although I will not discard the possibility that this may be the case. Wouldn’t worry about him too much Simon, that character seems to call everyone an infiltrator or shill, people notice that as well. 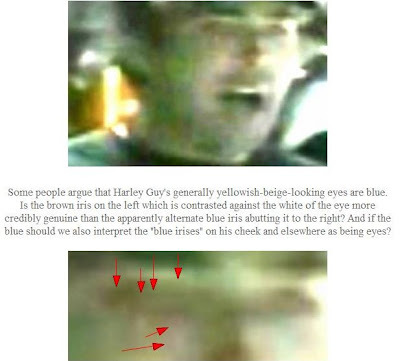 The Harley shirt Guy seems to have some green haze around his face, it looks kind of hard to compare, but IMO facial characteristics are very similar, the eyes look very much alike. 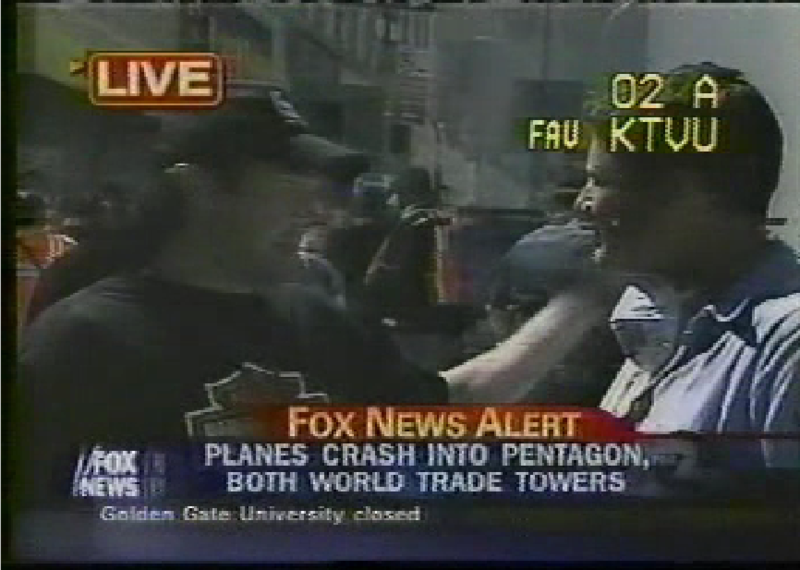 Mark Humphrey does have a double bump chin, it hard to see this double bump on the Harley shirt guy, as the fox footage is hazy, but it does not mean that it is not there. Zoom in these for a better view. The eyes shape and eyebrows look very alike. But where are his eye balls? I’m no Expert, but is this some kind of green screen flaws?? 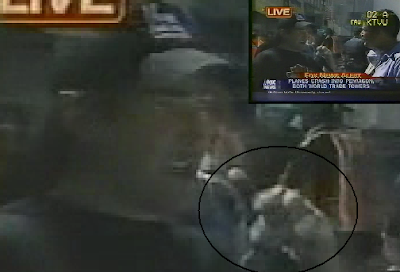 these shots it appears as the whole hand has been removed. Possibly removed to hide recognition??? But I’m defiantly above 80 percent in saying that it is. HE LOOKS VERY MUCH THE SAME. So what does Adrian Humphrey have to say about this?? Well I’m just going to say that he denies it all, Blatantly DENIES he is the Harley Shirt guy, he claims he was ON the west coast in LA @ a 12 step AA meting @ the time the twin towers were hit, and claims he went home to watch the rest of the event on TV ... what I don’t understand is that isn’t there like a time difference between west coast and east coast, to say he was in a AA meeting @ the times the planes hit means he would have to been at the AA meeting around 6.00 am. An AA meeting @ 6.am?? Apparently a version of the fox Harley shirt guy footage has been removed from YouTube. Like I said I don’t know how exactly we could confirm this, but if it was ripped, how on earth could Adrian Humphreys claim copyright on something that did not star him??? witnessed both towers collapse, one first then the second. Mostly due to structural failure because the fire was just too intense." It's a very convincing case. I wish we could find others like it. I wonder if we are meant to be confused by which sims are distorted actors and which are scrambled face pieces. For some reason I don't think it's necessary for there to be 3,000 actors. Likely? Plausible? Maybe, but not necessary. I think the Luke Rudowski sim is like this case in that it may be a real actor. Return to THE 9/11 HOAX infrastructure - and its operatives: too many people involved?